In the 13 heaviest states, 60 percent of residents will be obese in less than two decades if current trends continue, finds a new report. Think Americans are fat now? After all, a third of us are overweight and another 35 percent are obese. But a report out Tuesday projects 44 percent of Americans will be obese by 2030. In the 13 worst states, 60 percent of the residents will be obese in less than two decades if current trends continue, the report from the Trust for America’s Health projects. That’s not chubby or a little plump – that’s clinically obese, bringing a higher risk of heart attacks, strokes, diabetes, several forms of cancer and arthritis. “The initial reaction is to say, ‘Oh it couldn’t be that bad’,” says Jeff Levi, executive director of the Trust for America’s Health. 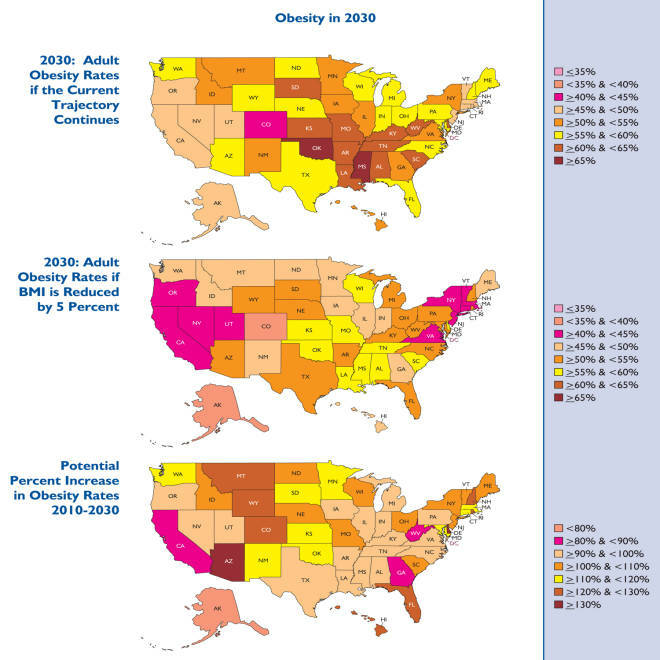 “But we have maps from 1991 and you see almost all the states below 10 percent.” By 2011 every single state was above 20 percent obesity, as measured by body mass index (BMI), the accepted medical way to calculate obesity. Those with a BMI or 30 or above are considered obese. In August, the Centers for Disease Control and Prevention reported that 12 states have an adult obesity rate over 30 percent. 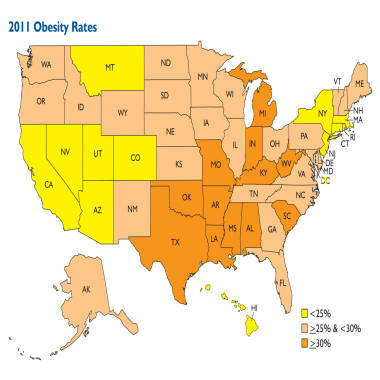 Mississippi had the highest rate of obesity at 34.9 percent. On the low end, 20.7 percent of Colorado residents are obese. CDC projections for obesity resemble those in Tuesday's report - it projects 42 percent of adults will be obese by 2030. That’s bad news when states are already strapped to pay for public health programs such as Medicaid and the federal government is struggling to fund Medicare. Over the next 20 years, more than 6 million patients will be able to blame obesity for their diabetes, 5 million will be diagnosed with heart disease and 400,000 will get cancer caused by obesity. And some of them are frighteningly young. "Now I am seeing 25-year-olds weighing 350 pounds who present with chest pain or shortness of breath," says Dr. Sheldon Litwin, a cardiologist at Georgia Health Sciences University. “Everything from the heart disease process to its diagnosis and treatment are affected by obesity. We see it every day. This really is the number-one issue facing us," added Litwin, who worked on one of a series of obesity studies published in this week’s issue of the Journal of the American Medical Association. For instance, making it easier for people to exercise day in and day out, and making it easier to get healthy food. “A large-scale study of New York City adults found that increasing the density of healthy food outlets, such as supermarkets, fruit and vegetable markets, and natural food stores is associated with lower BMIs and lower prevalence of obesity," the report reads. What about initiatives like New York’s controversial ban on the largest sodas? “Every community is going to experiment with different approaches. It is going to be very interesting to see what happens in New York and whether this makes a difference,” Levi said. New York’s health commissioner, Dr. Thomas Farley, defends the move in the medical journal’s obesity issue. "How should government address the health problems caused by this successful marketing of food? To do nothing is to invite even higher rates of obesity, diabetes, and related mortality,” he wrote. Many studies have also shown that people who live in big, walkable cities such as New York and Washington D.C. are thinner than their rural and suburban counterparts, and it’s almost certainly because they walk more and use public transportation instead of sitting in cars. If everyone lost just a little weight, the savings would be enormous, the study predicts. “If we could lower obesity trends by reducing body mass indices (BMIs) by only 5 percent in each state, we could spare millions of Americans from serious health problems and save billions of dollars in health spending —between 6.5 percent and 7.8 percent in costs in almost every state,” the report says. Education can’t hurt, either. The more educated people are, the less likely they are to be obese. Higher-earners are also thinner. “More than 33 percent of adults who earn less than $15,000 per year were obese, compared with 24.6 percent of those who earned at least $50,000 per year,” the report notes. And several studies have shown that people who eat more fruits and vegetables are thinner, as well as healthier. “Seven of the 10 states with the highest rates of obesity were also in the bottom 10 for fruit and vegetable consumption,” the report says. For some people, drastic measures remain an option. 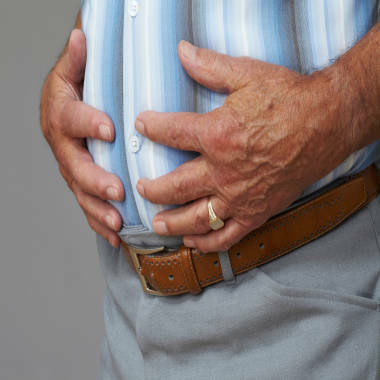 One study in the Journal shows that gastric bypass surgery is a viable option. And two doctors present opposing views over whether the Food and Drug Administration holds obesity drugs to an unreasonably high standard. On Tuesday, one of the newest obesity drugs hits the market - Qsymia, made by Vivus. If you’re 5 feet 6 inches tall, you become overweight at 160 pounds (a BMI of 25.1) and obese at 192 pounds, when your BMI grows to 30.1.